SCVHistory.com | Saugus | Bermite Predecessor: Ex-Fighter Jim Jeffries & L.A. Powder Co., 1917. Ex-Fighter Jim Jeffries & L.A. Powder Co. Establish Gunpowder Plant in 1917 at future Bermite Site in Saugus to Supply Allies in Great War. Los Angeles Times | May 20, 1915. 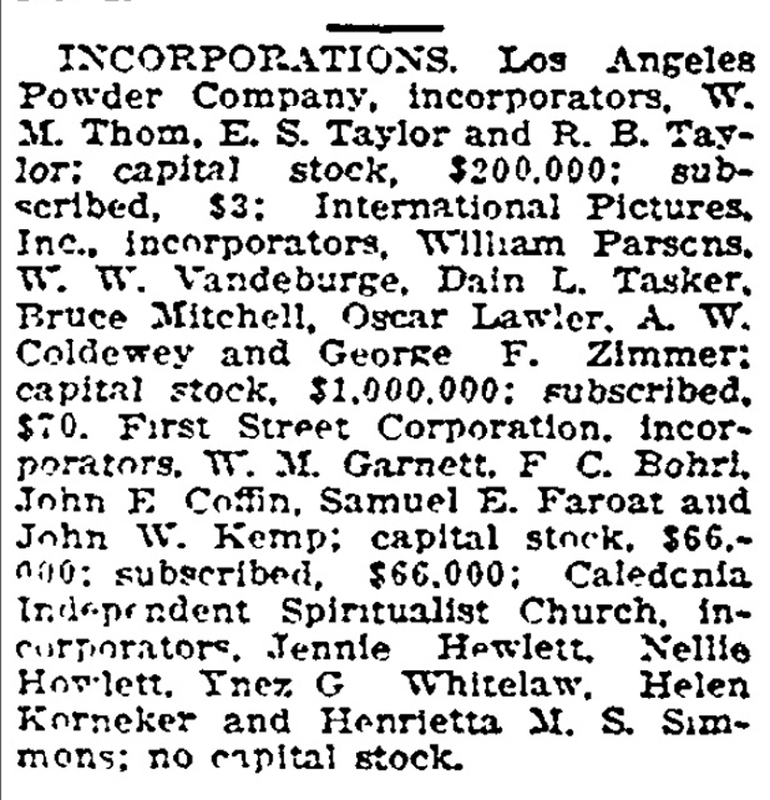 Los Angeles Powder Company, incorporators, W.M. Thom, E.S. Taylor and R.B. Taylor; capital stock, $200,000; subscribed, $3. Webmaster's note: See reference to Taylor below. It does appear to be the same company later run by ex-fighter Jim "The Boilermaker" Jeffries (b. April 15, 1875; d. March 3, 1953). The first production appears to have come in 1917. Ex-Champion Jim Jeffries Controls New Powder Secret. Fort Wayne (Ind.) Sentinel | May 18, 1917. Los Angeles, May 18. 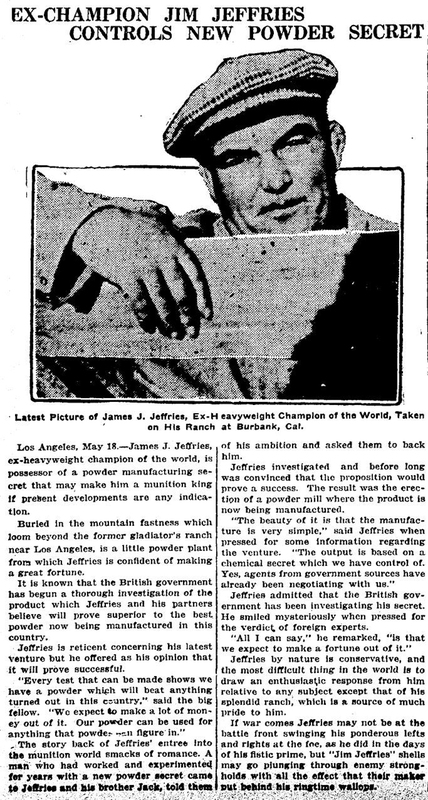 — James J. Jeffries, ex-heavyweight champion of the world, is possessor of a powder manufacturing secret that may make him a munition king if present developments are any indication. 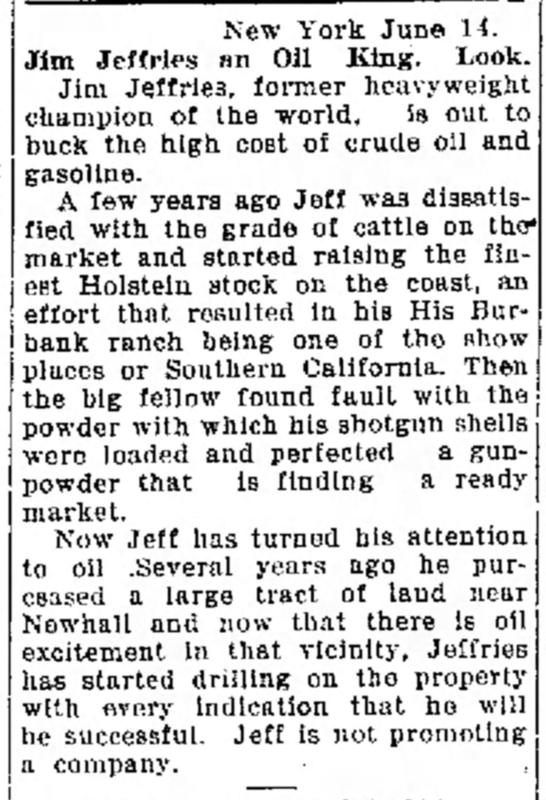 Buried in the mountain fastness which loom beyond the former gladiator's ranch near Los Angeles, is a little powder plant from which Jeffries is confident of making a great fortune. It is known that the British government has begun a thorough investigation of the product which Jeffries and his partners believe will prove superior to the best powder now being manufactured in this country. Jeffries is reticent concerning his latest venture but he offered as his opinion that it will prove successful. "Every test that can be made shows we have a powder which will beat anything turned out in this country," said the big fellow. "We expect to make a lot of money out of it. Our powder can be used for anything that powder can figure in." The story back of Jeffries' entrée into the munition world smacks of romance. A man who had worked and experimented for years with a new powder secret came to Jeffries and his brother Jack, told them of his ambition and asked them to back him. Jeffries investigated and before long was convinced that the proposition would prove a success. The result was the erection of a powder mill where the product is now being manufactured. "The beauty of it is that the manufacture is very simple," said Jeffries when pressed for some information regarding the venture. "The output is based on a chemical secret which we have control of. Yes, agents from government sources have already been negotiating with us." Jeffries admitted that the British government has been investigating his secret. He smiled mysteriously when pressed for the verdict of foreign experts. "All I can say," he remarked, "is that we expect to make a fortune out of it." Jeffries by nature is conservative, and the most difficult thing in the world is to draw and enthusiastic response from him relative to any subject except that of his splendid ranch, which is a source of much pride to him. If war comes Jeffries may not be at the battle front swinging his ponderous lefts and rights at the foe, as he did in the day of his fistic prime, but "Jim Jeffries" shells may go plunging through enemy strongholds with all the effect that their maker put behind his ringtime wallops. Webmaster's note: The United States formally joined the war one month prior to this publication, on April 6, 1917, but didn't send troops until late in the year. Most of the direct U.S. involvement came in 1918. News story courtesy of Stan Walker. Jeff Fills First Order for Gunpowder. Salt Lake (Utah) Telegram | November 11, 1917. 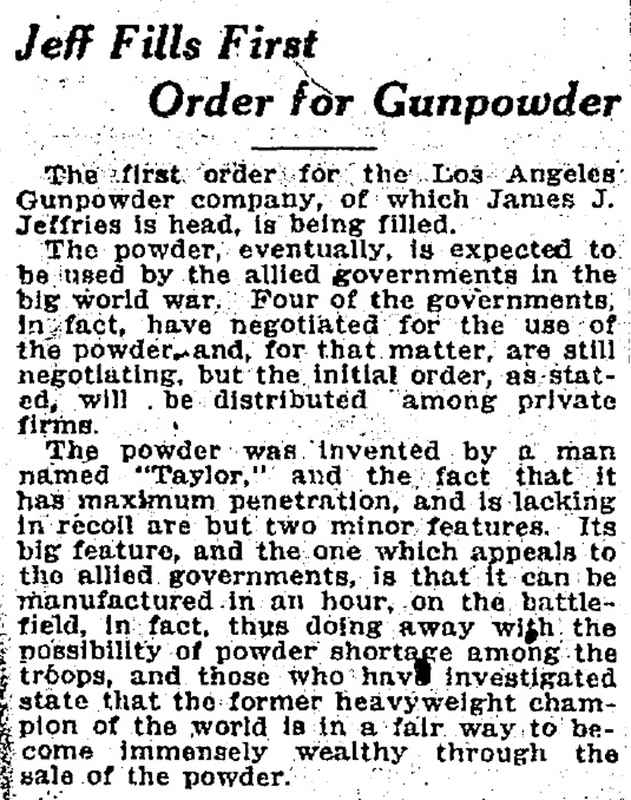 The first order for the Los Angeles Gunpowder company, of which James J. Jeffries is head, is being filled. The powder, eventually, is expected to be used by the allied governments in the big world war. Four of the governments, in fact, have negotiated for the use of the powder and, for that matter, are still negotiating, but the initial order, as stated, will be distributed among private firms. The powder was invented by a man named "Taylor," and the fact that it has a maximum penetration, and is lacking in recoil are but two minor features. Its big feature, and the one which appeals to the allied governments, is that it can be manufactured in an hour, on the battlefield, in fact, thus doing away with the possibility of powder shortage among the troops, and those who have investigated state that the former heavyweight champion of the world is in a fair way to become immensely wealthy through the sale of powder. Webmaster's note: We don't know which four governments were Jeffries' customers (assuming he actually had customers and this wasn't merely speculative bravado; see below). The United States wasn't one of the allied governments; technically, it was an "associated power." The major allies were France, Britain and Russia; Italy joined the entente in 1915; other members were Romania, Serbia, Turkey, Belgium, Greece, Montenegro, the Czechoslovak Legion and Japan. Jeffries to Make Munitions of War. Ogden (Utah) Examiner | March 12, 1918. Los Angeles, March 11. — Jim Jeffries, former heavyweight champion pugilist and now a saloonkeeper is going to help knock out the kaiser with a new kind of blow. He has gone into the gun powder business. Jack Jeffries announced last night that he and Jim have developed a powder factory in the hills near Saugus and that they are now sparring for government powder contracts. When they retire from the saloon business at the end of this month, they expect to devote practically all their time to the manufacture of gunpowder. "The Plant at Saugus was established about nine months ago," said Jack Jeffries. "We are using material dug out of the hills and the result is a splendid grade of smokeless powder. We have a representative in Washington seeking a government contract for us and if we get it the mill will be humming busily from now on. We call our plant the Jeffries Powder factory." Omaha (Neb.) World Herald | July 20, 1918. Jim Jeffries is now likely to achieve greater things as an inventor and manufacturer than he ever did in the ring. He has perfected a gun powder which may be used against the Hun hellyuns before another fortnight. C.E. Hopkins, vice president of the Los Angeles Powder company, of which Jeffries is the president, has just gone back to Los Angeles from Washington, D.C., with a favorable report from the government on the Jeffries' explosive on tests just finished at the Frankford arsenal, Philadelphia. The tests were conducted by Joseph Fine, explosive chemist at the arsenal, who reports that the powder is of high grade and especially adaptable for shotgun shells or other forms of ammunition requiring a bulk powder. According to Hopkins, Major Anderson, in charge of the Frankford arsenal, considers the powder ideal for use in trench mortars. Tested in a four-inch mortar, the powder showed a muzzle velocity of 2,000 feet per second, as against an average test of about 1,800 feet for other powders. A light recoil was registered and a low breech pressure. Jeffries states that at the government arsenal the powder showed great resistance to atmospheric conditions, and was subjected to a severe water proofing test and was given a very high rating, a strong point in its favor as a hunting or war powder. Jeffries has been assured that the powder will be given consideration soon, and is confident that it will be adopted by the government. Jeff sent me a couple of boxes of his shells by T.J. Foley, who recently returned from Los Angeles, but as yet we have had no opportunity to give them a trial. However, they are of the handsomest finish, and we haven't the slightest doubt but what they are all Jeff claims for them. Associated with him in their manufacture, is his brother Jack. They are both inveterate hunters, both big and upland game, and are well qualified as judges of these matters. Jim Jeffries an Oil King. Look. New Castle (Penn.) News | June 14, 1920. Jim Jeffries, former heavyweight champion of the world, is out to buck the high cost of crude oil and gasoline. A few years ago Jeff was dissatisfied with the grade of cattle on the market and started raising the finest Holstein stock on the coast, an effort that resulted in his Burbank ranch being one of the show places of Southern California. Then the big fellow found fault with the powder with which his shotgun shells were loaded and perfected a gunpowder that is finding a ready market. Now Jeff has turned his attention to oil. Several years ago he purchased a large tract of land near Newhall and now that there is oil excitement in that vicinity, Jeffries has started drilling on the property with every indication that he will be successful. Jeff is not promoting a company.